To her left (although she is not registering it in her field of vision) conveniently there is a small portable phonograph . . . and a large anonymous hand (parodying the Sistine Chapel ceiling?) 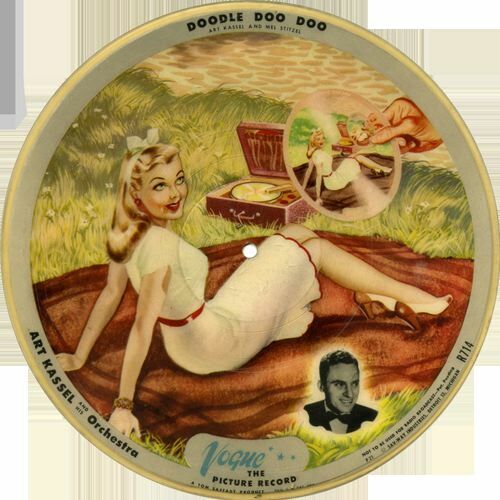 is offering her a phonograph record-replica of the larger scene, complete with lovely young woman and generous hand. The mind reels, and the recording isn’t even spinning. 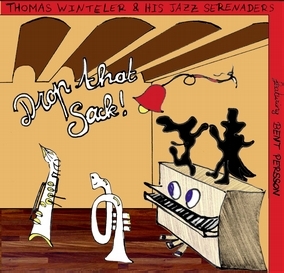 Thomas and his Jazz Serenaders have recorded DROP THAT SACK! — a CD of music associated with Louis and Sidney Bechet, including their collaborations and ending with two songs associated with later Bechet. The songs are ONCE IN A WHILE / ALLIGATOR CRAWL / SAVOY BLUES / ORIENTAL STRUT / TEXAS MOANER / DROP THAT SACK! / OLD-FASHIONED LOVE / BIG FAT MA AND SKINNY PA / PUT ‘EM DOWN BLUES / NOBODY KNOWS YOU WHEN YOU’RE DOWN AND OUT / DON’T FORGET TO MESS AROUND / PERDIDO STREET BLUES / DOWN IN HONKY TONK TOWN / STRANGE FRUIT / VIPER MAD / PETITE FLEUR. Pierre-Alain Maret, banjo, guitar; Henry Lemaire, bass; Jean Lavorel, drums. I hadn’t heard or heard of Thomas before the 2010 festival, but Bent Persson made a special point of recommending him to me — and when Bent recommends another musician, I take it seriously. Thomas is a superb player; like Bent, he understands not only the records but the idiom, and can nimbly become Bechet or Johnny Dodds while sounding like himself — no small accomplishment. And the CD is a delightful representation both of the Masters and of the twenty-first century musicians doing them honor. It’s always a pleasure to hear some of the less-recorded Hot Five and Hot Seven material, and this band is able to summon up the deep melancholy of STRANGE FRUIT as well as the jubilant elevation of VIPER MAD. You can find out more about Thomas and his friends (including his substantial discography complete with music clips) at his website, http://www.winteler-music.ch/. Finally, some speculative etymology. I think with affection of the Czech novelist Josef Skvorecky, who wrote in his novel THE COWARDS (or his novella THE BASS SAXOPHONE) of his difficulties with jazz-related English (he was a youthful amateur tenor player during the Second World War): encountering “Struttin’ With Some Barbecue” for the first time, he was puzzled by the word-by-word translation: could it really mean “Walking pompously with an animal carcass roasted whole”? I have the same feelings about “Drop that sack!” Is it really an old-time racially-based joke about chicken-stealing, or did it mean, “Let’s get out of here” or “Get rid of that unattractive person”?